“Vegan in Vegas” or eating vegan in the US | vegänsch. 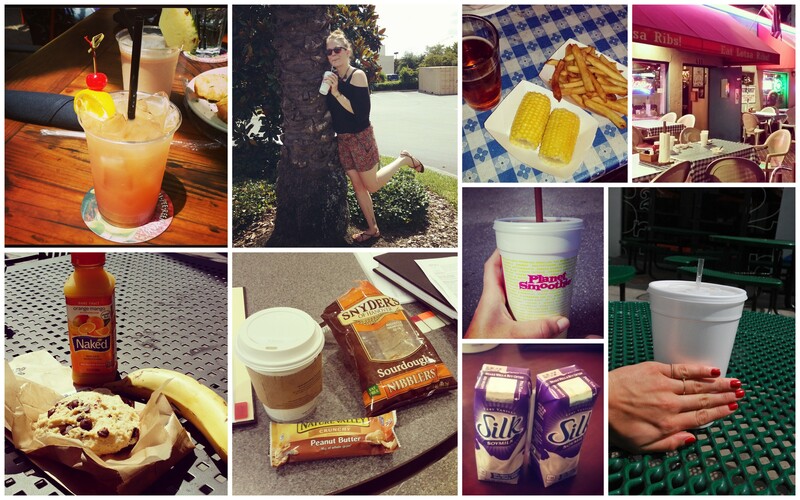 I’ve just got back from the US recently: My fifth trip to the States, but my first time as a vegan. Similar to my Stockholm post, I wanna share with you my best meals, some nice pictures and tips for those of you who live in or travel to the States soon. 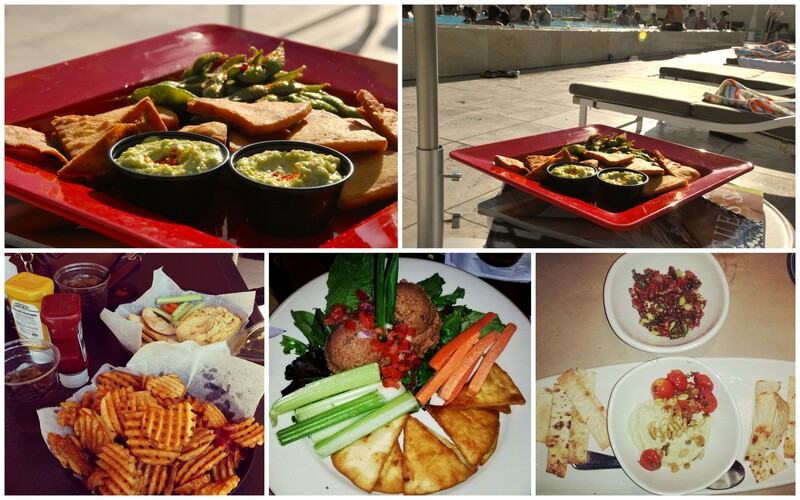 Loved the hummus at the Downtown Grand Hotel in Las Vegas – served right at the rooftop pool [top left & right]. It was actually hummus made with edamame, Japanese style soy beans. 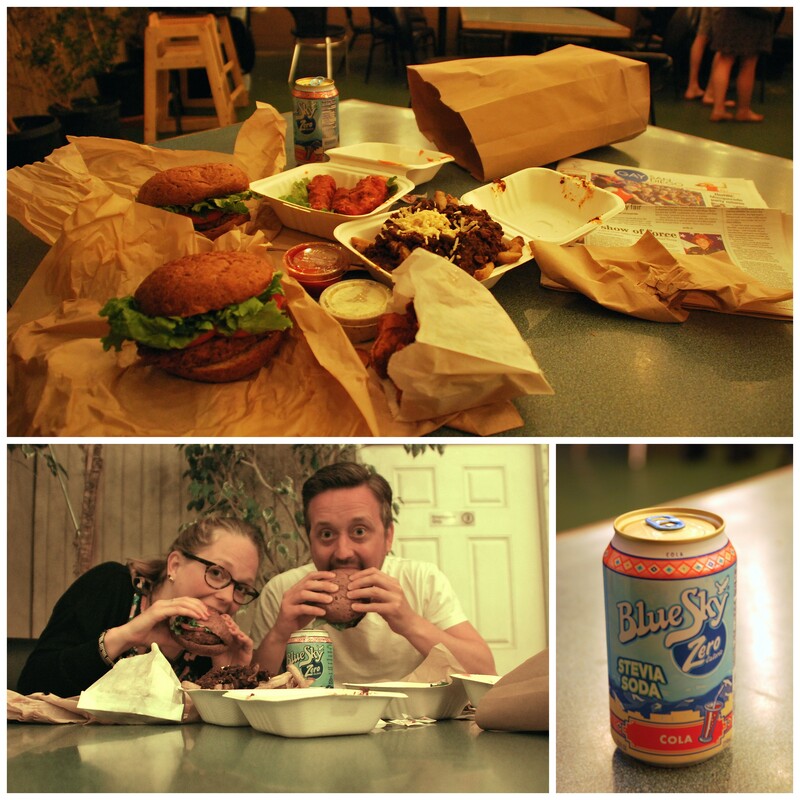 I also had a delicious black eyed pea hummus at nice Blues restaurant, B. B. King’s, in Orlando [center bottom]. 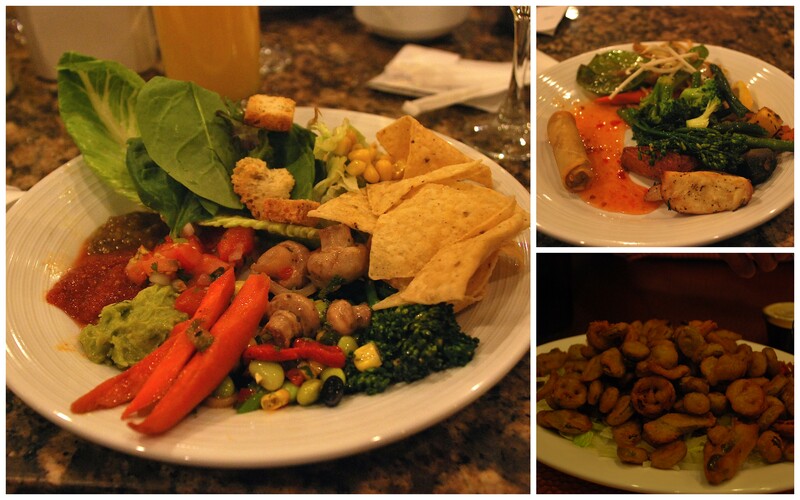 I also had a lot of salad/veggie varities – not boring at all! 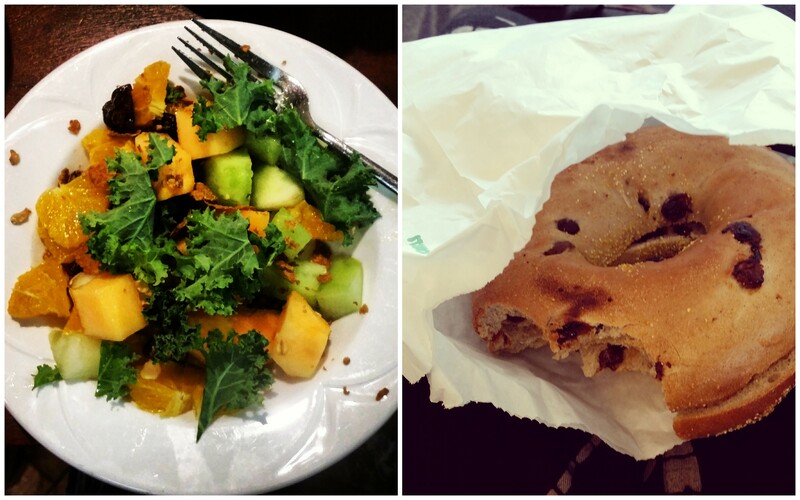 The best salad I EVER had was at Napizza in Little Italy, San Diego [top left]: kale, avocado, green beans, apples and quinoa with a lemon dressing. So nice and healthy! 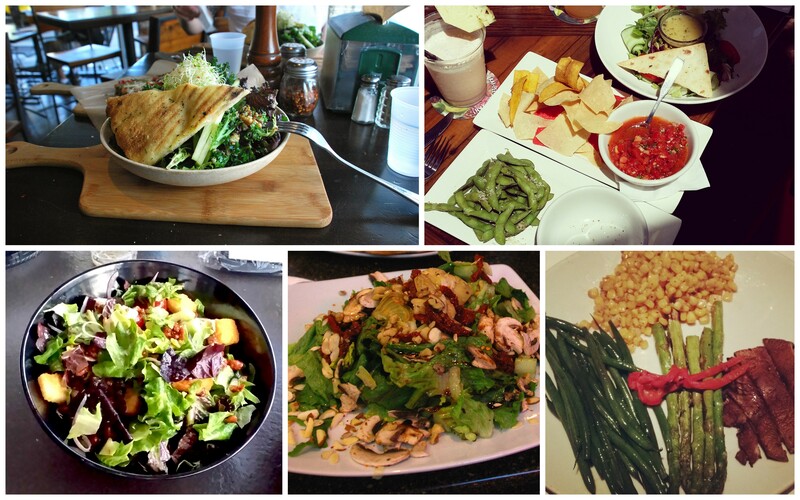 Another trend I noticed was to put candied nuts on top of a salad, for example candied pecans [bottom left]. What looks a bit boring, but was perfectly cooked and seasoned was the grilled veggies I had at Fleming’s Steakhouse in Orlando – especially the black pepper corn and hearty portobello [bottom right]. Throughout the US, there was a lot of Mexican food like burrito wraps and salads. Taco Bell’s veggie option without cheese and sour-cream was nice [left] and I also tried a delicious burrito bowl with the new Sofritas tofu at Mexcian food chain Chipotle [right]. 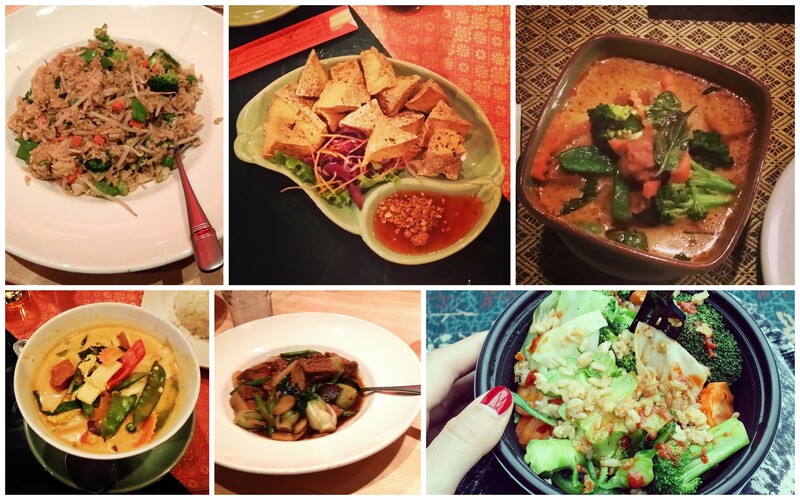 For a change, I also had a lot of Asian food like Thai and Chinese – actually my favourite eating-out-cuisine as it’s the easiest to find vegan options on the menu. Unfortunately, I found out after I bought it that the veggie and rice bowl [bottom right] contained egg. Well, I ate it in the end, cause I think that it’s more wasteful to throw it away and get a new dish. Still, I didn’t even tasted a benefit from the fried egg in the rice – so why put it in there at all, Panda Express? 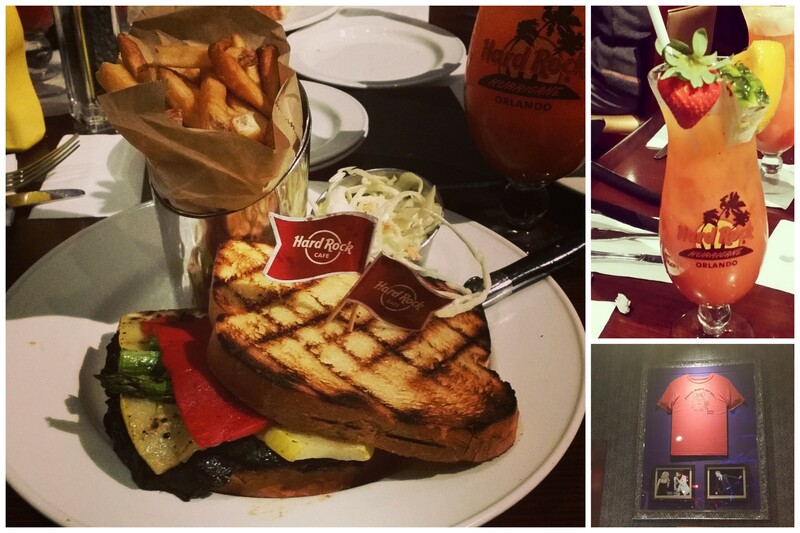 I’ve also been to a Hard Rock Café for the first time in Orlando. It was so cool to see that t-shirt worn by Justin Timberlake at a performance, hanging up there on the wall – it has a pig on it and says ‘Please don’t eat me’ : ) Timberlake is vegetarian. I had a veggie sandwich without cheese at the restaurant. 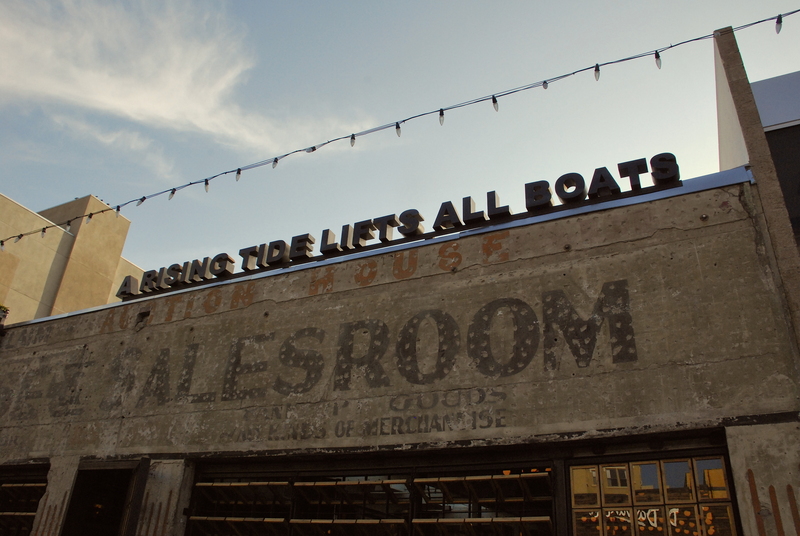 Another really nice place in Orlando (although the attached restaurant is a fish restaurant) was the bar at Ironside in Little Italy, San Diego. Never had such an artful cocktail! It was called ‘Death Charge’ (name = strength) and the glass was sprayed with some scent first, then gin and rum were cooled down with ice in separate glasses before poured together, the lemon zest was swiped around the glass and then added to the drink… The bartender did it which such a grace, he must feel the same way about mixing drinks as I do about preparing food! 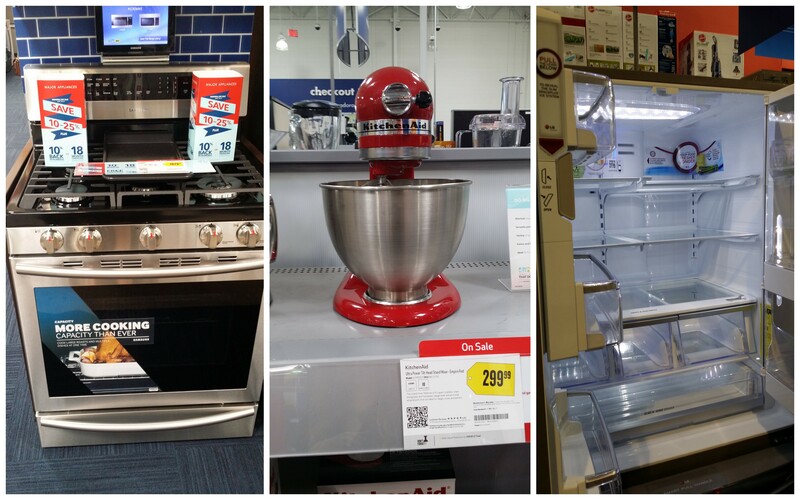 Speaking of preparing food: I was amazed by the wonderful (and often huge) kitchen equipment I saw at the Best Buy market. I took some pictures to set myself some goals in life ; ) You could almost climb into some of the fridges! Task for the left picture: Fill in the missing letter! And the right answer is… N! Well, unfortunately not, but I thought I’d take a picture of the blinking neon light without the last letter. I actually misread ‘Vegas’ for ‘Vegan’ quite often in the beginning, just because my head is so used to read the word vegan all the time ; ) I almost had a culture shock in Vegas because of all the lights, and the view from our room at the MGM Hotel did the rest – I must have looked like a child in a candy shop! 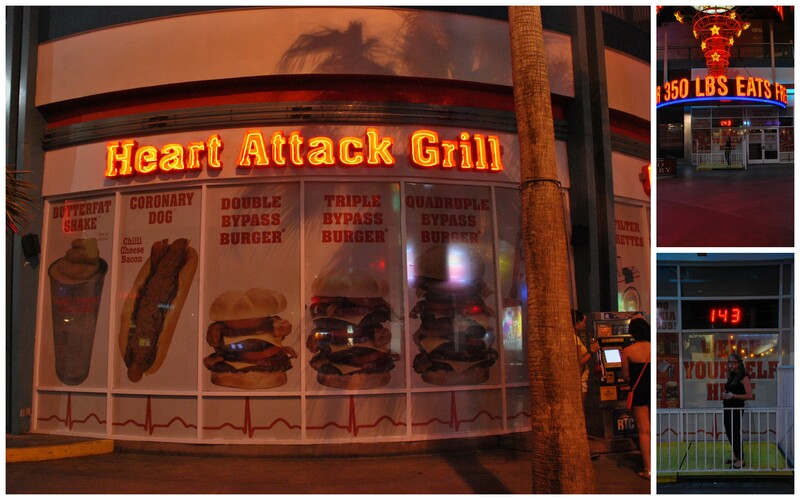 I wasn’t too happy to find this place in Vegas though: The Heart Attack Grill, a restaurant where you can have ridiculous dishes like burgers containing a few thousand calories and of course packed with meat, cheese, butter and lard. It said ‘Over 350 lbs eats free’ and even had a scale in front of the place! I’ve tried my best, but I guess I didn’t make the 350 pounds (~160 kg)… Sad to see such a place exists. 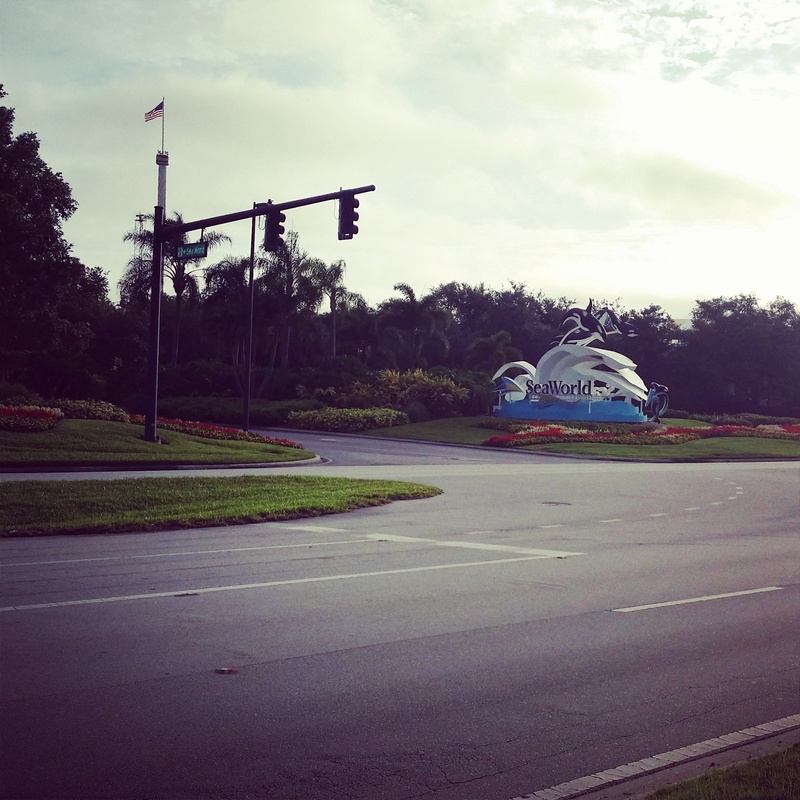 Another sad-to-see-it-exists-place: SeaWorld Orlando. Our hotel was literally right across it and when I went for a run ‘around the block’, I only made it once around the SeaWorld area as it’s so huge. After the run, I almost had to cry, cause it’s just so horrible to be so close to all these beautiful wild animals without being able to help them. If you’re interested, watch the brillant documentary Blackfish. Back to Vegas: A common thing in Vegas are the buffets that offer breakfast/brunch, lunch and dinner and are located inside the big hotels. Contrary to what I expected, there were a lot of vegan options like fresh salads, Mexican food, Asian cuisine, veggies, salsas, breads and potatoes. 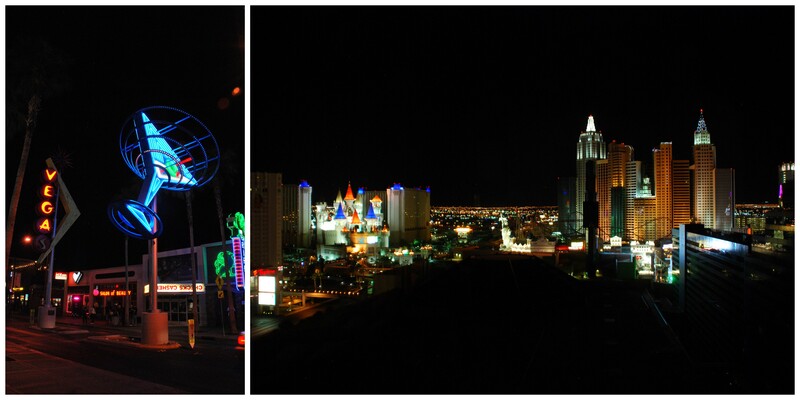 These two pictures where taken at the MGM. The bottom right one was a midnight snack at one of the casinos, battered and fried jalapenos – so greasy, though so delicious (we were on holiday, right? ; )). Other snacks I really appreciated were nice juices and smoothies (healthy), fries and corn on the cob at the bar where the piano scene of Top Gun was filmed (traditional), chocolate chip scone from an organic supermarket (I love US-supermarkets! ), coffee with soy-milk (with extra soy-milk supply from one of the waiters in Orlando – so nice! 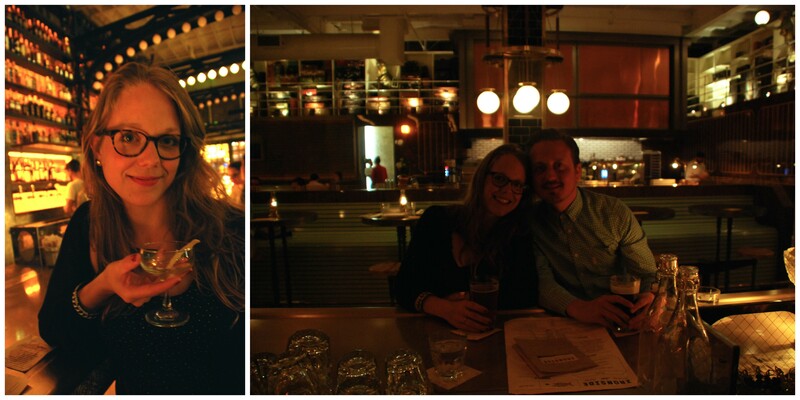 ), pretzel pieces and peanut butter bars (unhealthy) and the biggest softdrink I ever had (crazy!). Well, that was almost it – apart from the ‘Strict Vegetarian’ food I got on the plane thanks to the nice assistant who booked vegan plane meals a few weeks ahead for me. On the left, you see some polenta fritters with veggies, salad and fruit, the top right is a chickpea curry with spinach, quinoa salad and even a vegan carob cookie, and the bottom right picture is a tofu roll with greek pasta and veggies. 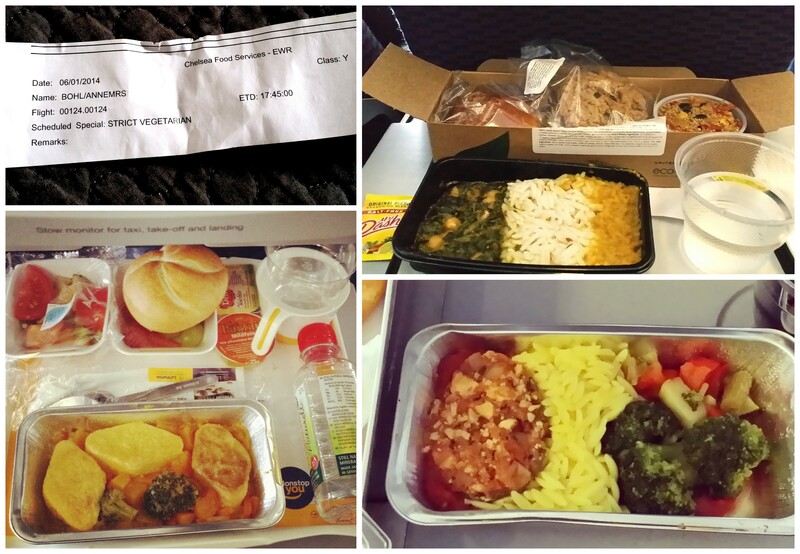 Not too bad, Lufthansa and United! Not to forget Alaska Airlines, who had a snack package with hummus, nuts and crisps clearly marked as vegan on their on-flight menu. Thanks for reading! If you like my stuff (or have suggestions ; )), feel free to like, share and/or leave a comment. You can also find me on Facebook. Every comment welcome! Oh wow, a vegan dessert on an airline?! I fly a LOT and never get anything besides fruit! Which airline gave you the vegan cookie?! Pingback: Guilt-free Oatmeal Raisin Cookies with Cinnamon & Almonds | vegänsch.